You must make reservations at least 5 minutes in advance of the time at Himalayan Heritage Restaurant & Bar. 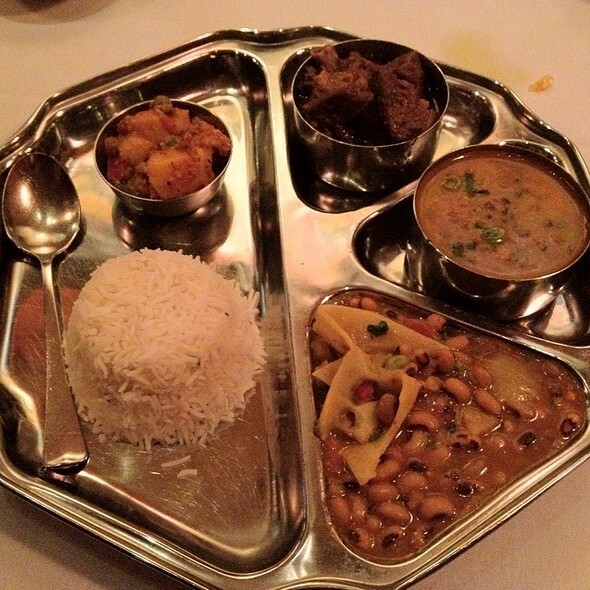 Voted Best 100 Restaurants in DC - Washingtonian Magazine 2009 & 2010, and located in the heart of Adam Morgan, Himalayan Heritage Restaurant & Bar provides the perfect fusion of Nepalese and Indian cuisine. We serve only the freshest ingredients, choice meats, and a wide variety of vegetarian options, spiced just right and sure to please even the most discerning palette. Our personable and attentive staff will more than exceed your every expectation. We look forward to being of service, and seeing you at your next visit to Himalayan Heritage. Always delicious, with friendly service. We split a vegetarian sampler, sambucas, and a chicken dish among the three of us, with added italian desserts. A good long walk is needed after. Always a go-to when I'm in DC. It was a family outing to explore Indian & Nepalese food. Everything was freakin amazing. The service was prompt and helpful in making our selections as well as accommodating due to half our party to the wrong location. Will definitely be going back and recommending. One of our favorite restaurants. Everything we have ordered over the years has been great! From the Gobi to the Saag Paneer. It wasn't crowded and could fit a table of 6 on friday. Food was interesting with Nepalese options. Not the best Indian in DC but definitely a good option. The food was great. I would definitely recommend this restaurant. Service was very good as well. It was amazingly delicious. They kindly let my friends bring in a Rainbow Cake Slice to celebrate my birthday. Want to go back again soon. Stopped in here with our family after a craving for Indian food. Everything was delicious and very reasonably priced. They don't have a children's menu, and seemed confused when I explained my daughter just wanted plain noodles. He told me that I would be charged for an adult meal for her, so I'm not complaining. A kids menu would be nice though. Great food! A little slow on the service at first but not bad at all. Attentive servers otherwise. Overall our party of 6 had a great experience! The service at this restaurant was slow. We were a table of 5 and we waited some time before being offered drinks or appetizers. Once the food arrived, however, we forgave the wait since the food was really good. Half the table was vegetarian but everyone found dishes that suited their tastes. Food was pretty authentic and tasty. Venue isn’t very polished - and I feel the prices didn’t reflect that. We have been to Himalaya many times and it is always excellent. We highly recommend. The food is more adapted to non Indian taste buds. Everything tasted underwhelming and bland. The server couldn't provide accurate description or recommendation for spicy dishes. Lovely meal, good serving size, and extremely authentic preparation. Their regular spicy level is not too spicy. Rice pudding dessert delicious. Food was OK. Everything seemed sweetened to suit western tastes. Service was patchy but possibly because it was quite full Saturday evening. The dumplings were good. One person in our party developed an stomach. Menu is more Indian than Himalayan/Nepali. Delicious flavor - everything was amazing like a party in my mouth! Chicken Korma was amazing and chicken vindaloo was excellent and perfectly spicy. Only needed one raita - the cocktails were perfect. The food was very good. However, there was confusion with our order that might have been a language issue. We were a party of 3 women. When one of our party ordered Chicken Tikka, the waiter indicated it would take 25 minutes. The person then said they would change their order to CHICKEN / PORK MO:MO (DUMPLING) but the waiter thought they had ordered both items?? They brought out both the dumpling orders (2 diners) but I had to wait a long time for my Chicken Korma because the waiter seemed to think we wanted both Chicken Tikka and Chicken Korma after 2 orders of dumplings. I would have rated the restaurant outstanding if it had not been for the confusion and delay receiving food. This was my first visit in several years. It was very enjoyable. The curries are outstanding. I also enjoyed the Himalayan Special drink. This spot was great! My family dined here for my moms birthday and the food was delicious. We just wish the portions were bigger. Great food, with a beautiful interior. The servers were all very welcoming and kind. Definitely worth a try if you have not ever had Nepalese food! We come here whenever we come to DC. 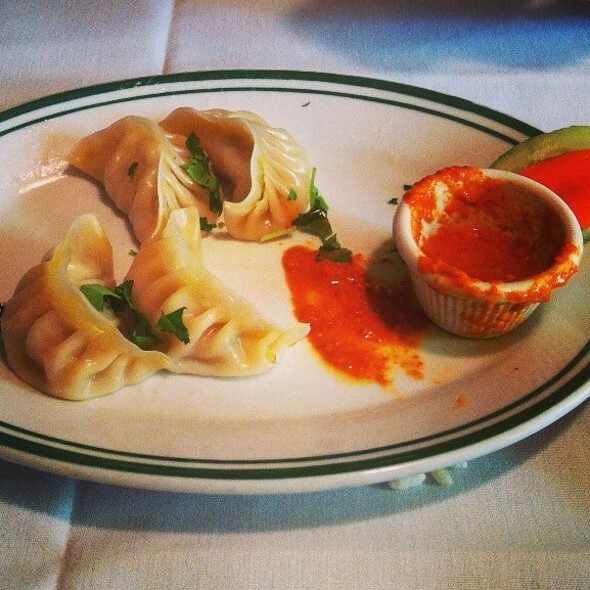 Fabulous momos, great Himalayan food (not many other places anywhere). All the dishes are great. Best of Himalayan and Indian food. Nice place, tasty food. A little scattered with the kitchen--we ordered before a larger group sat down. They were eating multiple dishes before we had anything! This was 40 minutes after arrival. So some glitches with that, but the ambiance was nice and the food was quite tasty. Busy but not crowded. Good selection of Northern Indian and Tibetan food. Spice was accurate. Able to have a conversation, which is always the mark of a good restaurant for me. Extensive wine list. Super food.... nice service, definitely go again! 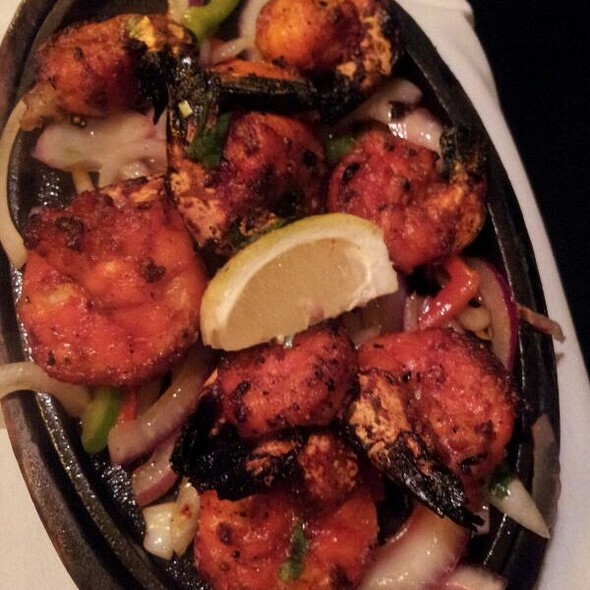 Some of the best Indian, Nepalese food we have had in the area. Just really fantastic. The staff was very helpful, the food was great. We were very happy with our first experience here. Three of us had dinner on a Saturday at 5:45. Before we left, at about 7:00, the place had filled and there were no empty tables . . . so come early. Two of us ordered Martinis, one gin and one vodka. They were rather watery when they reached the table. 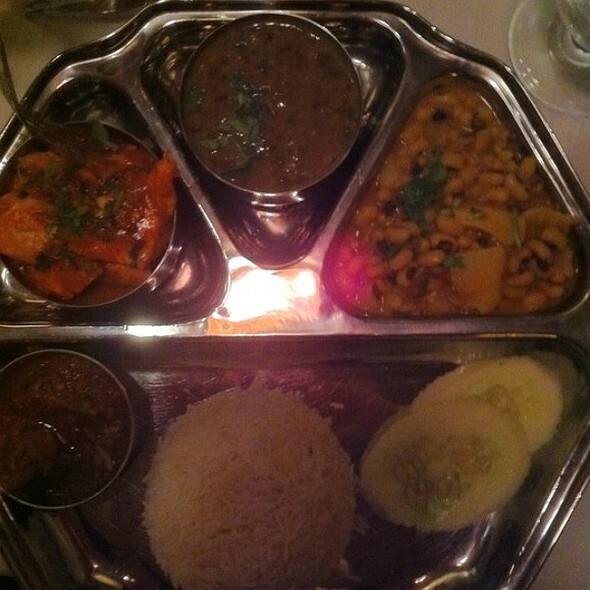 We also ordered the califlower starter, chicken mo mo, the Thukpa soup, a Himalayan curry, and a Nepalese thali. We ordered all the food spicy, and it was probably about Thai medium on the heat scale (for those of you who do a lot of Thai). The spices were excellent, which was the reason we were there ordering Nepalese, rather than Indian off that extensive menu. Everything we ordered was very good, although we would still like to find a Nepalese or Tibetan restaurant that focused just on that food, like the Blue Moon, a family Tibetan restaurant that used to be in San Francisco (no longer there), short of going to Montreal. Great spot for authentic Indian and Nepalese food. Enjoyed the variety of the menu and the service was excellent. Definitely a do again. The food was quite good. We all chose the Nepali items. 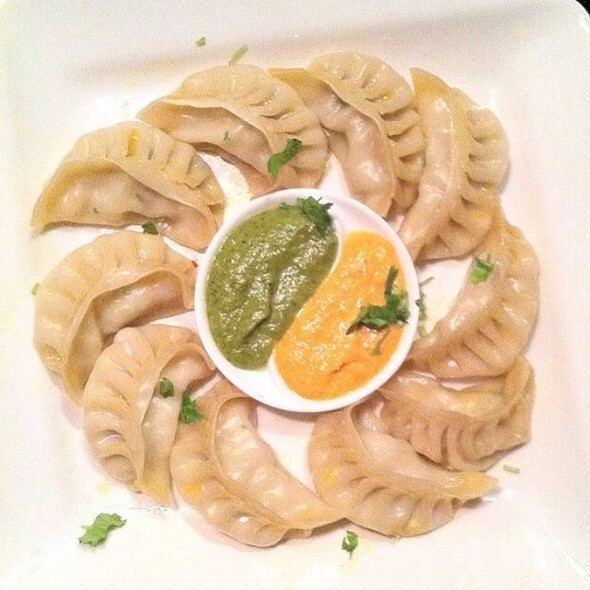 The momos were great. The service was very slow. It probably took them at least 15 minutes from seating us to taking the initial drink order and perhaps ten more minutes to actually serve the drinks. We took our son, his wife, preschool daughter, & infant son to Himalayan Heritage. All of us thought it was delicious. The food was excellent, especially the Mo Mo dumplings & crispy spinach. Service was responsive, polite, & gracious. Although we were the only ones in the restaurant with children, the staff was incredibly kind about bringing food for them quickly. We will return often to this neighborhood gem. I had eaten once before at Himalayan Heritage on a weekday. The food was delicious, and I decided to take visiting family there on a Saturday night. We had an 8:00 pm reservation, but there was nobody at the front podium to check us in. We ended up flagging down a waiter named Armaan, who said he was in charge of the tables and it would be a few minutes. We weren't seated until 8:30, with no update or explanation. All the waiters seemed to be avoiding the front of the restaurant, where there was a line of customers with reservations waiting to be seated. We couldn't even get drinks at the bar while we waited because there was nobody serving there. I don't know if they were understaffed that night or if they just had tables stay longer than expected, but the complete lack of communication ruined the dining experience. The food was still delicious, and the service once we were seated was fine. I wouldn't recommend this restaurant if anyone in your party expects a reasonable amount of accuracy when it comes to reservation time, or honesty from the servers. The food here makes the somewhat haphazard service worthwhile. My wife and I love Indian food but wanted to try something a little different than our go-to spot one night....so we ventured over to HH and we loved it! The only issue was the service had a bit of difficulty understanding our allergy concerns. Luckily we navigated the menu well and found the vegan options (pakora and eggplant curry) that hit the spot! Great night! Not enough staff. Waited for 20 minutes for water, another 20 for drinks, about 20 more for appetizers. Didn't order main course decided to just leave and go elsewhere. Staff seemed to not be assigned tables. Therefore staff didn't know who was taken care of and who wasn't. Unique Nepalese cuisine in between Indian and Persian with a hint of Chinese. 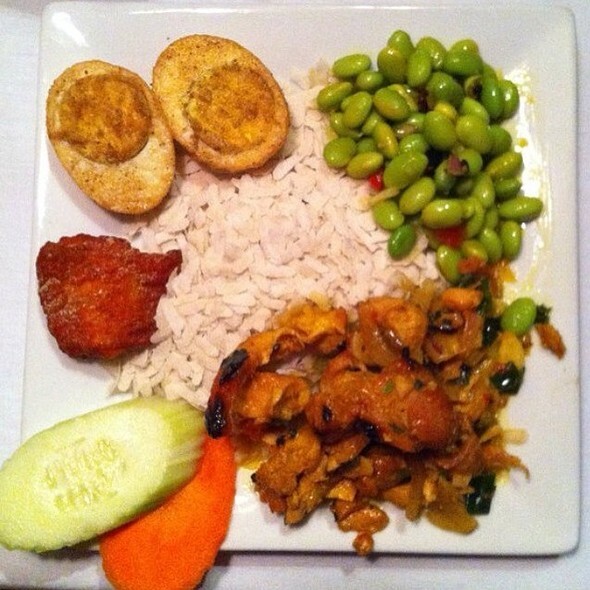 Take your time and order one individual plate at a time.